The "colonialist oppressor" narrative is collapsing in Zimbabwe. 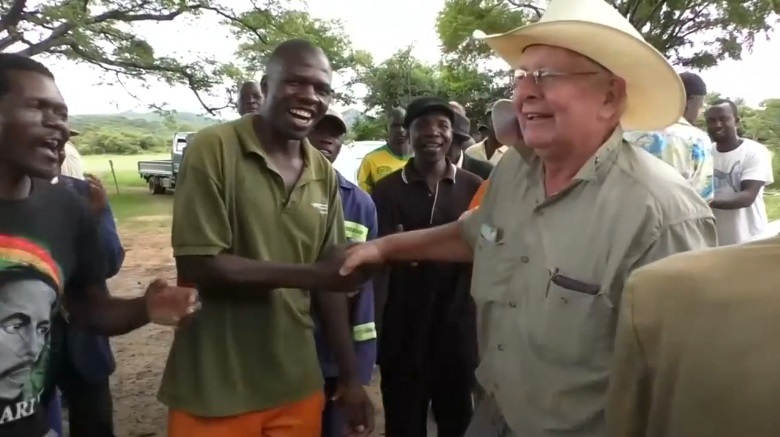 RUSAPE, Zimbabwe (Reuters) - The last time white Zimbabwean farmer Rob Smart left his land it was at gunpoint, forced out in June by riot police armed with tear gas and AK-47 assault rifles. He returned on Thursday to ululations and tears of joy from former workers and their families who were also kicked out - a jubilant return and the first sign that the president who has replaced Robert Mugabe is making good on a vow to stop illegal land seizures and restore property rights. 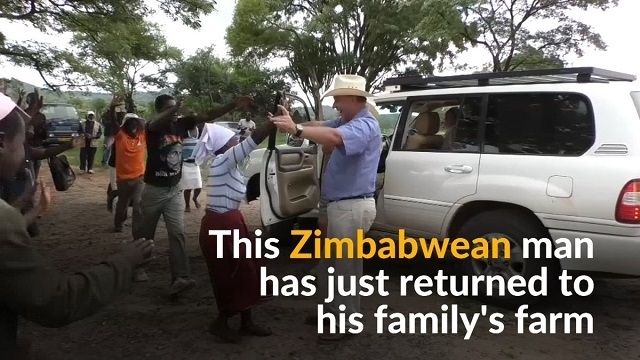 Scores of jubilant black Zimbabweans nearly knocked the 71-year-old off his feet as he and his two children stepped out of their car and onto their land for the first time in six months. Smart’s case was taken up by Emmerson Mnangagwa, Zimbabwe’s then vice-president who heard of Smart’s violent eviction while at an investment conference in Johannesburg. Mnangagwa became president last month following a de facto coup that ended 93-year-old Mugabe’s rule. 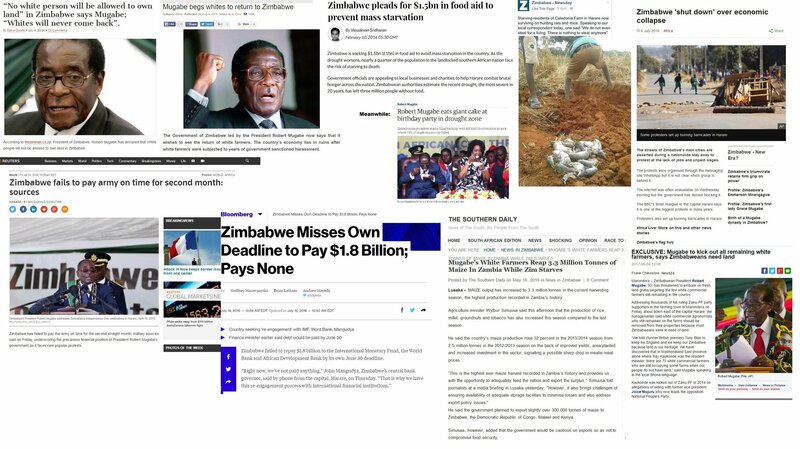 In the latter half of his 37 years in power, Zimbabwe’s economy collapsed, especially after the seizure of thousands of white-owned commercial farms under the banner of post-colonial land reform. Land ownership is one of Zimbabwe’s most sensitive political topics. Colonialists seized some of the best agricultural land and much of it remained in the hands of white farmers after independence in 1980 leaving many blacks effectively landless. Twenty years later, Mugabe authorized the violent invasion of many white-owned farms and justified it on the grounds that it was redressing imbalances from the colonial era. White farmers complained that well connected people used state security forces to force them off their farms, sometimes in the middle of harvesting, even after the Mugabe government indicated, some four years ago, that land seizures were over. “We are overjoyed, over the moon. We thought we would never see this day coming,” Smart’s son, Darryn, told Reuters. The "colonialist oppressor" narrative is falling apart before our very eyes. 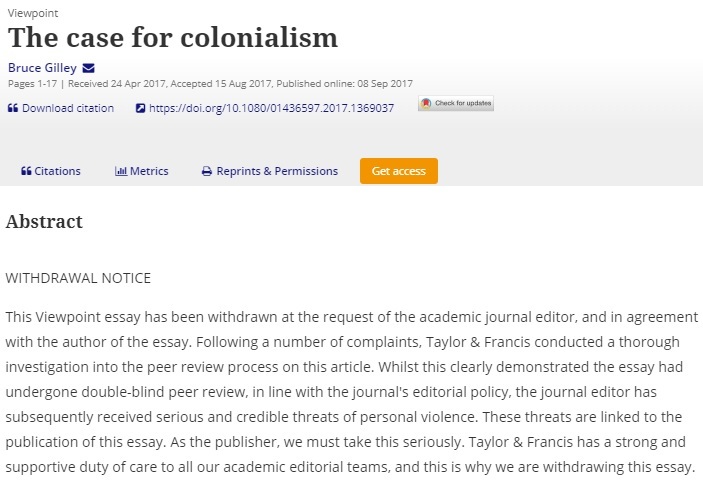 Professor Bruce Gilley of Portland State University recently released a double-blind peer reviewed paper titled, "A Case For Colonialism" in the London-based academic journal Third World Quarterly. Anti-colonial critics simply assert that colonialism was, in Hopkins’s words, ‘a foreign imposition lacking popular legitimacy’. Yet until very late, European colonialism appears to have been highly legitimate and for good reasons. Millions of people moved closer to areas of more intensive colonial rule, sent their children to colonial schools and hospitals, went beyond the call of duty in positions in colonial governments, reported crimes to colonial police, migrated from non-colonised to colonised areas, fought for colonial armies and participated in colonial political processes – all relatively voluntary acts. Indeed, the rapid spread and persistence of Western colonialism with very little force relative to the populations and areas concerned is prima facie evidence of its acceptance by subject populations compared to the feasible alternatives. The ‘preservers’, ‘facilitators’ and ‘collaborators’ of colonialism, as Abernethy shows, far outnumbered the ‘resisters’ at least until very late: ‘Imperial expansion was frequently the result not just of European push but also of indigenous pull’. It is hard to overstate the pernicious effects of global anti-colonialism on domestic and international affairs since the end of World War II. Anti-colonialism ravaged countries as nationalist elites mobilised illiterate populations with appeals to destroy the market economies, pluralistic and constitutional polities, and rational policy processes of European colonisers. In our ‘age of apology’ for atrocities, one of the many conspicuous silences has been an apology for the many atrocities visited upon Third World peoples by anti-colonial advocates. …A sobering World Bank report of 1996 noted: ‘Almost every African country has witnessed a systematic regression of capacity in the last 30 years; the majority had better capacity at independence than they now possess’. This loss of state capacity was no trifle; it meant the loss of tens of millions of lives. As Burton and Jennings note, ‘In the first decade or so after independence … East African governments often adopted or adapted both administrative structures and ideological concepts from their colonial predecessors in order to create quite successful forms of governance – certainly by regional standards’. In many cases, colonial bureaucrats and police were rehired by the newly independent governments. Despite cries of ‘exploitation’, colonialism was probably a money loser for imperial powers. The Stanford economist Richard Hammond coined the term ‘uneconomic imperialism’ to describe the ways that European powers embarked on ruinously costly and ultimately money-losing colonialism for largely non-economic reasons. That is why they gave up their colonies so easily, as Wu also showed with regard to the Dutch surrender of Taiwan. The benefits of empire were widely diffused while the costs were narrowly borne by the colonial power. As Kaplan wrote: ‘The real problem with imperialism is not that it is evil, but rather that it is too expensive and therefore a problematic grand strategy for a country like the United States’. To solve the incentives problem, Hechter has called for a ‘market in transnational governance’ which we might call less euphemistically ‘colonialism for hire’. Colonial states would be paid for their services, an important motivator to be successful. The contractual motivation would also strengthen consent through periodic renegotiation of the terms. As academic study is considered heresy by leftists, Gilley was labeled a "white supremacist" and his paper was withdrawn due to the Third World Quarterly being inundated with terroristic threats. Zimbabwe shows us what happens when anti-colonial, "decolonization" communist drivel is put into practice. The question is whether people are paying attention.